This castle sections does come lightly pre-primed with a gray latex paint. Pictures showing the model in the natural amber-brown polyurethane molding material, or that have been painted, are shown only for reference. 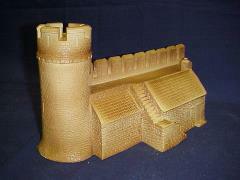 This model consists of one castle wall section. This section is modular and will fit together with any of the other 25mm Hudson & Allen castle wall models. The tower top is removable. The overall size of the section is approximately 14" long by 5" wide by 7.25" tall.